If you want to keep your gadget going six times longer, you know what you need to do. The reason you know is that the Duracell Bunny has pounded this association into the minds of consumers over the last half century or so. For the last fifty years the playbook for creating brands has been to take a product or service, wrap it in a series of brand associations that connects with the target audience, use mass market media to drive awareness and distribute through physical channels. In Duracell’s case this meant driving sales through supermarket placements and promotion, coupled with building the brand promise – your batteries will last six times longer. Placed next to batteries that cost half the price but only last one sixth the time, the maths is easy. The Grocer describes how distribution and promotion has also driven sales performance over the last fifty years, but since 2013 sales have been falling through traditional retailers. In 2014, Proctor and Gamble sold Duracell in order to exit the alkaline battery business. Duracell is not the only brand under threat. Amazon’s private label is attacking entire sectors which were once dominated by household brand names. To understand how brands can best respond, we must first understand the trends that are driving consumer purchasing habits to change. Historically, people built emotional connections to brands through exposure to advertising in mainstream media over many years. Now crowdsourced content from properties such as Open Table, Trip Advisor and Amazon reviews, and of course your social graph on Facebook offer a new tools of due diligence for consumers. Empowered consumers, with a super computer in their pocket, can research and compare products and place orders in seconds. In the pre-internet era, many organisations derived competitive advantage from powerful distribution networks. These networks acted as barriers to new entrants and protected profit margins. Large multinational companies could use their scale to dominate a channel; whether that was more shelf space or a network of retailers or IFAs. Amazon search results are the new shelf space for many brands and new start ups can use free distribution on the internet to disrupt the business models of incumbents. In fact, large organisations are now often disadvantaged by their once powerful distribution networks. 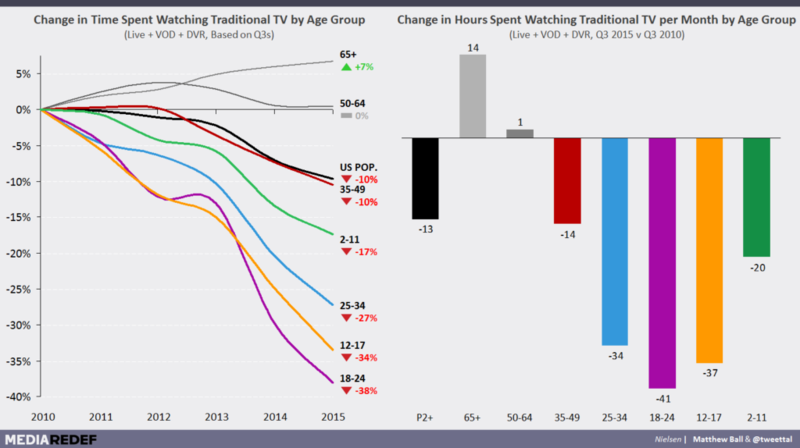 This famous chart from Redef highlights the change in hours spent watching TV by age group. It shows that attention of millennials is rapidly shifting online. The three age groups with the biggest declines are the most attractive to the brand advertisers that dominate TV advertising. As TV viewing starts to move away from linear and cable bundles, the effectiveness of TV advertising in creating brand associations will begin to wane. In parallel, brand building through digital marketing with the likes of Facebook, YouTube, PPC, and sites like FourSquare will begin to offer immersive advertising formats which also link to data about the individual and track visits offline. 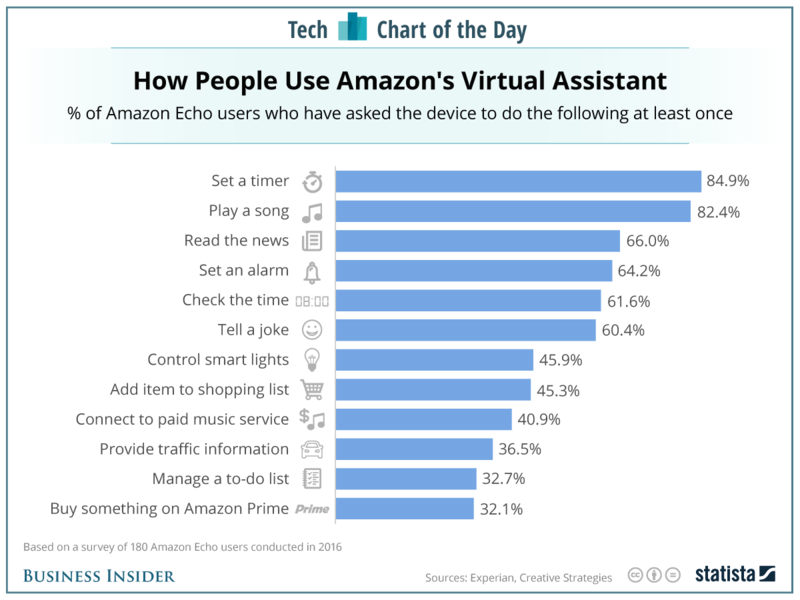 However, Amazon have been working hard to migrate consumers to using Alexa to buy directly from Amazon – even going as far as offering the same product at a cheaper price when it is ordered via Echo compared to buying through the Amazon website. Google is also working hard to turn voice into opportunities for delivering more advertising. One click purchasing on websites will soon move to zero click ordering. Purchasing via voice significantly reduces the impact of traditional brand building techniques such as packaging. It also introduces the power of the default – whatever Google or Amazon decides is the default product or service for that search term will win the largest share of sales. For routine purchases, consumers will begin to trust what Amazon offers – be it batteries, dishwasher tablets, or dog food. These changes offer tremendous opportunities to companies that are building new brands. Traditionally, if you didn’t have a million pounds to invest in marketing and a powerful distribution network, the chances of breaking through with a new brand were low. Now, products and services that offer great experiences have a chance. What should brands do to be successful? Spend more time and money investing in making a good product or service. Invest in the customer experience: it’s the new battle ground, now that distribution is free. To learn more about our approach to developing products, follow this link. Highly-targeted and highly-measurable Facebook advertising have given rise to an increasing number of boutique brands that deliver superior products to very targeted groups. 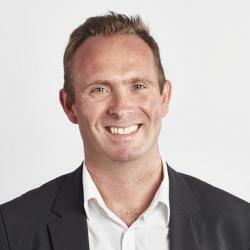 As our Head of Digital Marketing, John, explains in this article, creating buyer personas can save your business time and money. Identifying your buyer persona is vital to your brand strategy – your research will identify your target audience. Applying this knowledge to your paid ad targeting will ensure you are appearing in front of the people who matter. Advanced analytics for Facebook and other paid advertising online can feed even more data into your buyer persona and improve your ad targeting even more – increasing the likelihood of a strong marketing ROI. Find out more about our Paid Advertising services here. 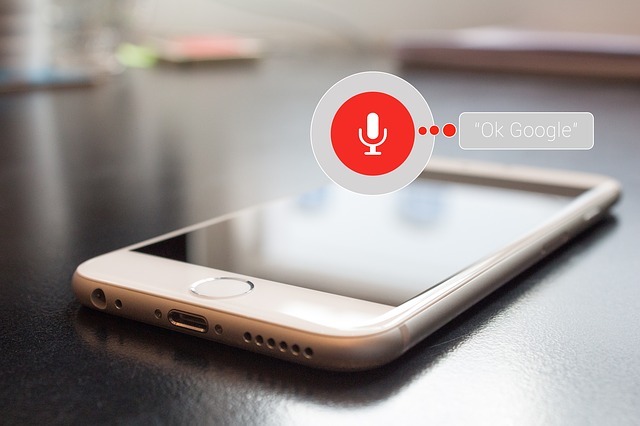 Capitalise on the opportunities provided by new technologies like voice search by investing in great content. Answer the questions your prospects will ask. Remember that the content you create should be considered part of the product you are selling, not the promotion that is selling it. As the product requires investment, so does the content that supports it. Create brand associations that translate well in these new disruptive environments. Find ways to use content to empower your users to buy your products, not simply to sell to them. Learn more about our SEO and Content Marketing services here. As we can see above, it is not just new business models that disrupt existing markets, but it can also be new marketplace models that disrupt ways of doing business. The risk for brands is that relying on the playbook of the late 20th century will consign them to be part of that history. Those that build a brand strategy for the new generation can write their own history. To talk to us about how we can help you develop and execute your own digital marketing strategy for 2018, contact us.